All are welcome to attend the Centennial Commemoration for Piper James C. Richardson VC, October 8th, 2016. The pipes are coming “home!” – Piper James C. Richardson’s bagpipes, lost a century ago on the battlefield, will be on display during the Centennial Commemoration at the Chilliwack Museum. 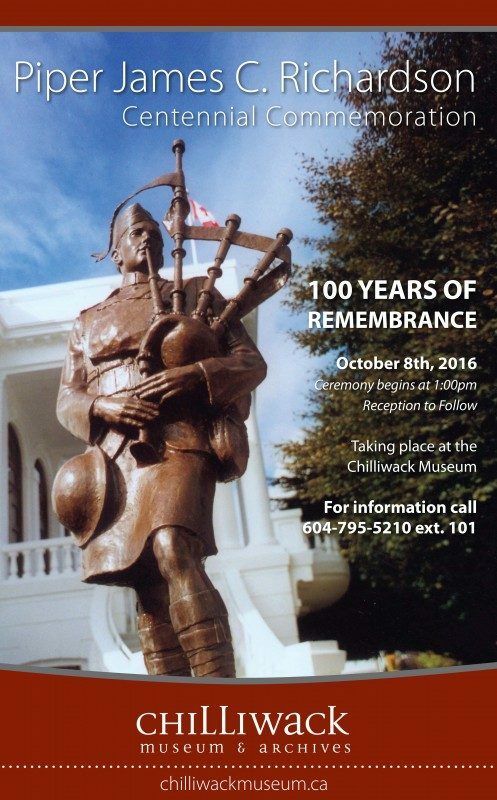 On Saturday, October 8th, 2016, the Chilliwack Museum and Archives will host an event to commemorate the centennial of the valorous death in battle at the Somme of Piper James Cleland Richardson VC. The day will mark one hundred years since Piper Richardson courageously gave in life in service at Regina Trench. The day also marks the 13th anniversary of the dedication of the statue of Piper Richardson on the Museum grounds, and the 10th anniversary of the repatriation of his bagpipes to Canada from Scotland. At 12:30pm, while guests are arriving, musical selections will be performed by the Chilliwack Harmony Chorus. The program will begin promptly at 1:00pm, and the public is invited to attend. The Commanding Officer of the Canadian Scottish Regiment (Princess Mary’s) has confirmed his attendance, together with members of his Pipe Major and other guests. Royal Canadian Legion #4 will form the Colour Party, and members of RCL#280 are also cordially invited. Dress with medals is requested. Other members of the Richardson family have been invited, along with local dignitaries. We are asking attendees to gather at the Museum grounds near the Piper Richardson monument – 45820 Spadina Avenue in Chilliwack – at 12:30pm. Limited seating for invited guests and seniors will be available, but will generally be standing room only. Following the ceremony, a reception will take place in the Chambers Gallery at the Museum, to which all are invited. Through the courtesy of the Legislative Assembly of British Columbia, and the Speaker of the House, the Honourable Linda Reid, the bagpipes belonging to Piper James Richardson, which were recovered from the battlefield at Regina Trench, will be temporarily on display in the Chilliwack Museum, following the event. These pipes are part of the permanent collection of the Legislative Assembly. We are grateful to Mayor Sharon Gaetz, and Mr. Laurie Throness, MLA, for their assistance in facilitating the loan to Chilliwack of this significant Canadian artifact. James Richardson’s historic “home” pipes, which he played prior to deployment overseas, will also be present, and will be played during the ceremony. This will be a dignified event that will honour one of Canada and Chilliwack’s true heroes. Please join us!